After three shuttle flights, however, NASA discontinued use of the backpack in space for several reasons — most famously, safety considerations following the shuttle Challenger explosion of 1986. But thirty years on, the problem of dead satellites is growing. There are now thousands of pieces whipping around our planet, occasionally causing collisions and generally causing headaches for people wanting to launch stuff into orbit safely. Space agencies such as NASA and the European Space Agency have been working hard on reducing debris during launches, but there’s still stuff from decades before. And when a satellite goes dead, if it’s in the wrong orbit it could be circling up there for decades before burning up. How do you fix that? Robotics has come a long way in 30 years, so space agencies are looking to use those instead to pick up derelict satellites since that would pose far less danger to astronauts. One example is the e.DeOrbit mission recently talked about by ESA, which would pick up debris in polar orbits of altitudes between 800 and 1,000 kilometers (about 500 to 620 miles). The mission would use autonomous control and image sensors to get up close to the drifting satellite, and then capture it in some way. Several ideas are being considered, ESA added. A big enough net could easily nab the satellite, or perhaps one could clamp on using tentacles or grab it with a harpoon or robotic arm. Here’s a 2013 proposal with more information on e.DeOrbit. ESA noted there is a symposium coming up May 6 to discuss this in more detail. e.DeOrbit is one of just several proposals to pick satellites up. A Swiss idea called CleanSpace One appears to use a sort of pincer claw to grab satellites for retrieval. The Phoenix program (proposed by Defense Advanced Research Projects Agency) would take useable parts off of broken satellites for use in new satellites, and in past years DARPA had some ideas to remove satellites from orbit as well. Another option is satellite refueling to make these machines useable again, a possibility that NASA, Canada and many others are taking seriously. What do you think is the best solution? Leave your thoughts in the comments. At first thought collecting and reusing all the hi tec junk in orbit seems like the only sensible option. I am guessing it must be full of rare metals and such, not to mention the investment in energy just to get the mass up into orbit. Just causing it to de-orbit and burn up seems wasteful. The question is then whether the resources expended recovering it out weigh the benefits. I would think that this balance would shift towards recovery as efficient solutions are developed and perhaps the resources themselves become more valuable. Perhaps in the shorter term some sort of designated parking orbit should be set up, an orbiting recycling centre, and the effort should be to lump the junk together, out of the way, for future reuse when that becomes feasible. One solution I didn’t see was attaching positionable rockets to bring the satellite back to earth. If they knew beforehand all the targets of the space cleanup then one satellite could conceivably go into space with multiple rockets and skip from one satellite to the next harpooning on rockets for mission control to bring down to earth before it would fire its own rockets to burn up on reentry. The amount of fuel that would require would be unbelievable great. The expense would bankrupt the entire planet. That’s why you haven’t seen that idea mentioned very often. It’s been ruled out as being impossible in practice. 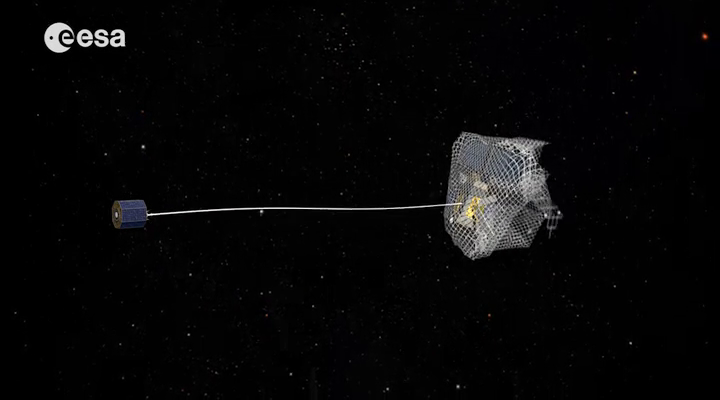 Approaching and interacting with derelict space objects will be difficult, as the story says they are likely tumbling. And they do not have convenient attachment points. What is needed is an incremental program that builds up to missions designed to mitigate orbital debris, and that means more expense. CleanSpaceOne is an interesting concept but they have not yet thought about how to accurately locate a CubeSat and approach close enough to do proximity operations. That is a big task. The DARPA Phoenix program is sometimes described as being able to eliminate orbital debris but they intend to disassemble spacecraft in orbit and assemble some new satellite. Almost certainly that means that they will liberate small pieces, creating more orbital debris in close proximity to the new satellite. Phoenix appears to be a system that will create more orbital debris rather than eliminating some. The carcass of the spacecraft that was cannibalized will still be there in orbit. If satellites are to be moved in orbit then the delta-v matching propellent is going to be very expensive. I think solar sail tech is probably a good match here, SunCatcher hangs on to the satellite and can boosts or retard using its sail. Add a Bigelow style module to the ISS and you can drag in satellites and service/recyle them in a large, pressurised micro-g workshop (the first non-astronaut jobs in space?). You can also bring up new ones up bit by bit and assemble them. Dead satellite carcasses might also make good radiation shields for deep space missions. Back in the late 80’s we purchased an EMP weapon from the old Soviet Union. This weapon is basically a copper tube wrapped in stainless steel tubing. Liquid N2 fills the tubing and makes the assembly superconducting. A shaped charge in the middle of the copper tube is exploded at the same time a bank of high voltage capacitors are discharged. The resultant ‘beam’ is a pulse as high as 800 megawatts. These weapons are used to destroy the vehicle ignitions, block all E/M transmissions and otherwise disable electronics equipment modern armies are so reliant upon. oTay then… painting space junk with successive e/m blasts of that magnitude would definitely modify a satellite’s orbit. The bonus in this idea is that it could be done from the ground. Picking up is fine, where do they drop it?? ?